Like a great film or book, music should be transportive ? it should take you away to another place. Pop music rarely does this, new age fails by trying to take you to a place that is dull and unrealistic and a lot of world music fails by its lack of adventure. Strangely, music that melds those elements, such as Dead Can Dance and Peter Gabriel?s Real World efforts, can be more powerful than astral projection. 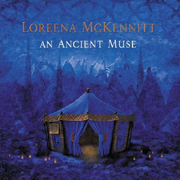 Few are as fine at this trick than Loreena McKennitt, the Canadian-Celtic singer/harpist/composer who returns after nearly a decade with An Ancient Muse. Much of McKennitt?s more popular work has centered on Middle Eastern themes and textures, and she maintains her fascinating fascination with the region here and continues to all but ignore the harp. Instead, players use exotic instruments such as kanoun, hurdy gurdy, tabla, oud, bouzouki, nyckleharpa, lyra, etc. to weave a tapestry of ancient, mysterious and haunting sounds over which McKennitt, with her nimble, angelic voice, chants and sings poetics from and inspired by a cast of renowned literary figures. But An Ancient Muse isn?t simply for the NPR crowd. With understated drums and distorted guitar, ?Beneath a Phrygian Sky? possesses an eerie, epic quality not unlike Sin?ad O'Connor?s more majestic musings while several other tracks come off like a better-studied Enya. While An Ancient Muse doesn?t really break any new ground for McKennitt, it certainly isn?t simply repeating herself. Rather, she driving further into the literary, musical and magical traditions she is drawn to, and if you have the patience, she?s more than willing to take you along.